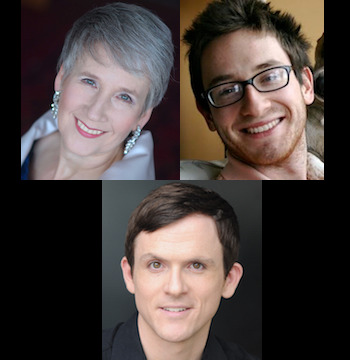 Piano and soprano duo Nate Ben-Horin and Mary Ellen Callahan are pleased to welcome their dear friend and very talented guest artist, tenor Jonathan Smucker, in a program of opera arias and duets from the finest, most moving, and dramatic operas in the repertoire! They will perform music by Monteverdi, Handel, Mozart, Donizetti, Verdi, Massenet, Puccini, J. Strauss, and other exciting surprises! Bay Area native Mary Ellen Callahan appears as soloist across the nation in a variety of repertoires. Recent performances include Bach’s St. John Passion at Lincoln Center, Mahler's Eighth Symphony and Handel’s Messiah in Carnegie Hall, Carmina Burana in the Metropolitan Opera House, and the Bach B Minor Mass and Mozart Mass in C Minor at the Kennedy Center. Ms. Callahan is delighted as always to be returning to sing at the Piedmont Piano Company. She has also had repeat concert and recording engagements with American Bach Soloists, the Washington Bach Consort, and the New Mexico Symphony Orchestra in performances including Bach’s Christmas Oratorio, Magnificat, and B Minor Mass, Handel’s Messiah, and Mozart’s Requiem and Mass in C Minor. She has worked with New York’s Mostly Mozart Festival Orchestra and with Musica Sacra, with the Utah, Harrisburg, San Antonio, Austin, Hartford and Kansas City Symphonies, the Alabama, Memphis and New Mexico Symphony Orchestras, the Buffalo Philharmonic, the Orchestra of the Age of Enlightenment, St. Luke’s Chamber Ensemble, and the Carmel Bach Festival, singing Poulenc, Fauré, Mahler, Brahms, Beethoven, Mozart, Handel, Bach, and many other composers. An avid recitalist, Ms. Callahan collaborates frequently with artists in New York and on the West Coast in music ranging from the early Baroque to works by living composers. Her solo recital in Carnegie Hall’s Weill Hall was sung to a sold-out house. After living and working in New York City for 26 years, she has now returned to her beloved Bay Area. Returning to New York regularly, she continues to perform and teach both here and on the East Coast. Nate Ben-Horin is a pianist, singer and composer. A San Francisco native, he graduated from UC Berkeley in 2014, where he won the Austin F. William Prize in piano performance, and was subsequently hired as a staff accompanist and choral assistant. As a freelancing musician, he has worked with West Edge Opera for several seasons, the Jewish Folk Choruses of San Francisco and Berkeley, and many local singers and instrumentalists. This August, he will move to Montreal to begin his master’s degree in collaborative piano at McGill University, supported by fellowships from both McGill and UC Berkeley. Ohio-born tenor Jonathan Smucker has sung more than 45 diverse roles in opera, oratorio, operetta and musical theater. Hailed as “a polished singing actor” (SFCV.org) and praised for singing “with clarity and fluency” (SF Chronicle), he maintains an extensive performance calendar throughout the Bay Area and California. This season, Jonathan debuted with Ars Minerva as Gligoro in the modern premiere of Zeani’s La Circe, its first performance since 1665, and made a solo debut with American Bach Soloists in the Monteverdi Vespers. He joins the San Francisco Opera Chorus for the doublebill of Cavalleria Rusticana and Pagliacci this fall. Jonathan is a long-time member of the Philharmonia Baroque Orchestra Chorale, appearing frequently with the Orchestra in solo parts, including a Lincoln Center debut in Handel’s Teseo in 2014. This spring he returns to the PBOC solo roster as The Witch of Endor in Handel’s Saul, including a performance at Disney Hall in Los Angeles. A strong advocate for new music, Jonathan has sung in numerous premieres and workshops, including the San Francisco readings of Bates’s The (r)Evolution of Steve Jobs, Laura Kaminsky's Today it Rains, and Perla’s Shalimar the Clown, and as Manager/Secretary in the US premiere of O’Regan’s Heart of Darkness with Opera Parallèle and Max in the world premier of Colombo’s Hunter for Opera Theater Unlimited.